Heat oven to 350°F (325°F for dark or nonstick pan). Generously grease or spray bottom only of 13x9-inch pan. In small bowl, toss 1/2 cup of the chocolate chips with 1 tablespoon of the dry cake mix. Make cake batter as directed on box--except stir in 1/2 cup of the coated chocolate chips. Reserve 1 cup of the batter. Pour remaining batter into pan. Stir chocolate syrup into reserved batter. Drop by tablespoonfuls randomly in 8 mounds in pan. Cut through batters in S-shaped curves. Turn pan one-fourth turn; repeat. Bake 33 to 38 minutes or until toothpick inserted in center of chocolate portion of cake comes out almost clean. Run knife around sides of pan to loosen cake. Cool completely, about 1 hour. Stir remaining 1/4 cup chocolate chips into frosting. Spread frosting on cake. 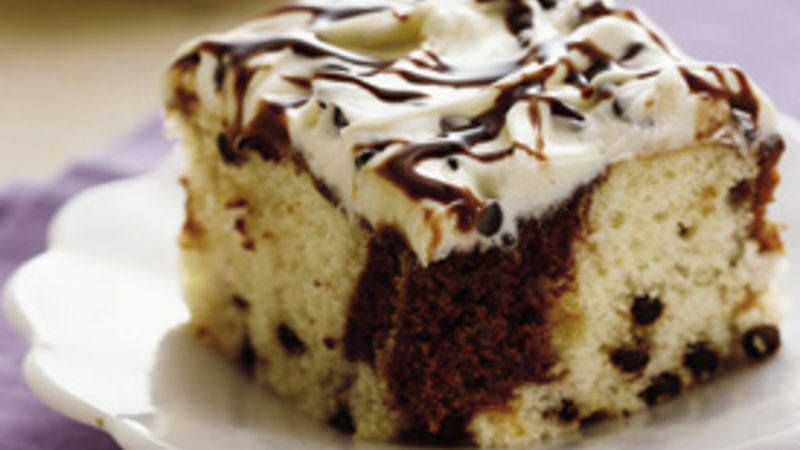 If desired, drizzle additional chocolate syrup over top. Store loosely covered.